In the modern age of comic book movies, there is perhaps no greater failure than Fox's 2015 reboot of Fantastic Four. As much as people may have their issues with Batman V Superman: Dawn of Justice and Suicide Squad, those movies were at least successful at the box office and are movies that had a lot of potential. There is very little positive to say about director Josh Trank's Fantastic Four. Despite the fact that pretty much everyone agrees it was a terrible movie, it looks like Fox still wants to make The Fantastic Four 2. Recently, long time X-Men writer and producer Simon Kinberg spoke with Collider in anticipation of the upcoming third and final Wolverine movie Logan, which, unlike Fantastic Four, has been getting rave reviews. At one point the conversation turned to Fantastic Four and whether or not we would ever see an alternate cut of the movie, since there is quite a bit of footage that didn't wind up in the theatrically released version. Simon Kinberg's response made it clear that Fox isn't done with the franchise yet and that Fantastic Four 2 is still very much a possibility. Here is what he had to say. "I don't know the answer to that in terms of whether or not fans will ever see it. I think B-roll is probably the place where they will see it. And for us, it's in the past in the sense of lessons learned and we would love to make another Fantastic Four movie. We really believe in that cast, and I think the lessons that we learned would help us make a more consistent movie than we did the first time." There was always the possibility of another reboot at some point down the road, but the way Simon Kinberg talks about it here, it looks like they would like to bring back Kate Mara, Miles Teller, Michael B. Jordan and Jamie Bell and let them have another go at it. There are many that hope the rights for the Fantastic Four would revert back to Marvel Studios, which is still a possibility, but not a likely one. 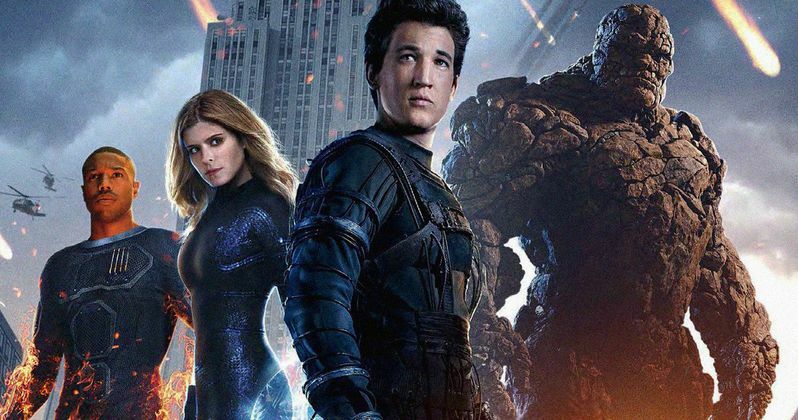 When asked if Fox would actually have to keep making Fantastic Four movies in order to keep the rights, Simon Kinberg admitted he didn't know the answer to that question, but also made it clear that they wouldn't just make the movie simply to retain the rights. "I have no idea. I think the truth is we would not make another Fantastic Four movie until it was ready to be made. One of the lessons we learned on that movie is that we want to make sure we get it 100% right, because we will not get another chance with the fans." They probably already have blown their chance with fans as there is virtually no desire to see Fantastic Four 2 happen, but there are other problems. Michael B. Jordan is one of the most in-demand stars at the moment, despite the failure of Fantastic Four. In fact, he is already getting a shot at another superhero franchise. He will be playing Erik Killmonger in Marvel's Black Panther. That movie is being done for Marvel Studios, and Fantastic Four is currently owned by Fox. At the moment, the two studios aren't really getting along very well, with Marvel pulling X-Men and Fantastic Four merchandise off shelves, and decreasing the presence of those characters in the comic books. The fact that Michael B. Jordan has defected may make it tricky for him to return for Fantastic Four 2. Though the actors did sign multi-film contracts, but it isn't clear where that all stands now. In any case that is something that would need to be addressed. As it stands, Josh Trank's Fantastic Four sits at an abysmal 9 percent approval rating from critics on Rotten Tomatoes, with an equally awful 18 percent audience score. The movie also failed miserably at the box office, bringing in only $167 million worldwide on a very high $120 million production budget. Despite that, Simon Kinberg makes it sound like Fox would want another shot at it. If anyone would know, he would. Not only has he been writing and producing X-Men movies for more than a decade, but he is rumored to be directing X-Men 7 for Fox as well, which would be his directorial debut. So he is very much in the know when it comes to the Marvel properties at Fox. Let's just hope they are too busy making Deadpool movies to dedicate any resources to Fantastic Four 2.